Glass tube level indicator made of brass - Borosilicate and quartz glass, mica, sealing, level gauges, armature - Continental Trade. 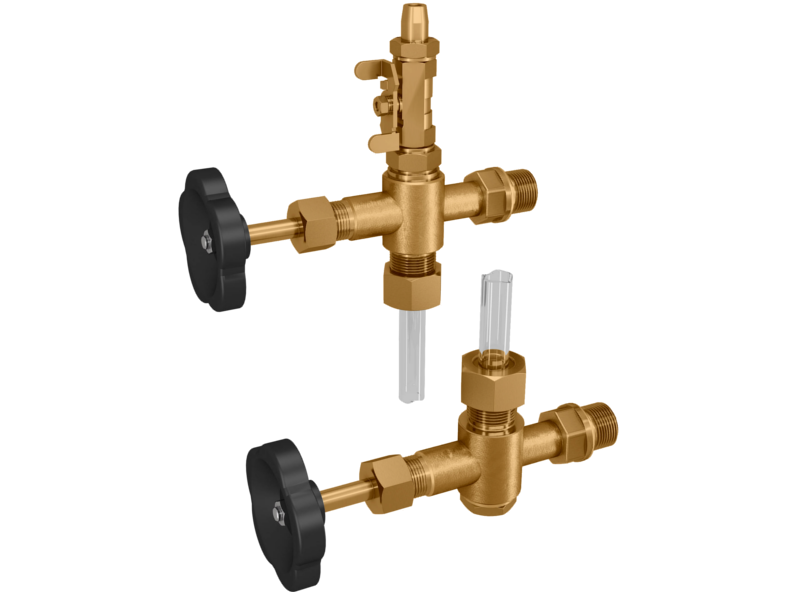 The ACI filling level indicator Type 461 is a glass pipe bypass indicator with connection fittings made of high-quality brass. The connection with the tank to be monitored is through threaded connections right by the container wall. Type 461 is supplied not mounted due to the delicate glass parts. After the connection fittings have been connected to the wall of the unit, the glass pipe is inserted into the packing seals of each connection fitting and screwed tight. You can choose between PTFE and EPDM as sealing materials. While PTFE is very chemical-resistant, the EPDM packing seal is significantly more durable, in case the glass pipe must often be dismantled, for example for cleaning. Due to the integrated stop valves, the Type 461 filling level indicator can be separated quickly and reliably from the monitored container and emptied in a controlled manner, so that the unit does not need to be decommissioned for maintenance and cleaning work on the filling level display. Type 461 offers the best possible view of the process medium through the glass pipe construction. If the filling level should still be difficult to read, for example for clear and colourless liquids such as water, we offer optional float balls made of plastic, which float on the surface of the liquid and can be seen easily even from a greater distance or in poor lighting conditions. Type 461 can be supplied in a choice of lengths. For longer lengths, we use intermediate supports that are not connected to the interior of the container and only serve to connect several sections of glass. This ensures in addition that the glass pipe is supported at regular intervals, which reduces the risk of damage during operation. To virtually eliminate damage of the glass pipe, a specially made impact protection casing made of Plexiglas is available that surrounds the whole length of the glass pipe and protects it from impact damage. Contact our sales team to find the best solution for your system. from connection center to Center min. 170 mm to max. 1600 mm.